What do you get when man’s best friend meets a celiac’s worst enemy? A gluten-sniffing dog! For people with celiac disease or gluten intolerance, service dogs that detect gluten can offer peace of mind and allow greater ease in traveling, eating out and going about daily life. This can spare the dog owners pain and hospital bills as they navigate the world of gluten-free living. Allergen detecting dogs are growing in popularity and are “the most accurate and practical form of scent detection readily available,” according to Allergen Detection Service Dogs (ADSS). Though the dogs are not infallible, ADSS says they are the best resource available. A trained allergen detection dog can accurately search an environment and alert to the presence of the odor of gluten. Service dogs already help people who are blind, deaf, have mental illnesses, diabetes, epilepsy and many other conditions. Service animals are defined by the Americans with Disabilities Act as “dogs that are individually trained to do work or perform tasks for people with disabilities…The work or task a dog has been trained to provide must be directly related to the person’s disability.” U.S. Federal law allows certified service dogs, including gluten-sniffing dogs, to go anywhere the general public is allowed to go, including restaurants, movie theaters, stores, hotels and most schools. 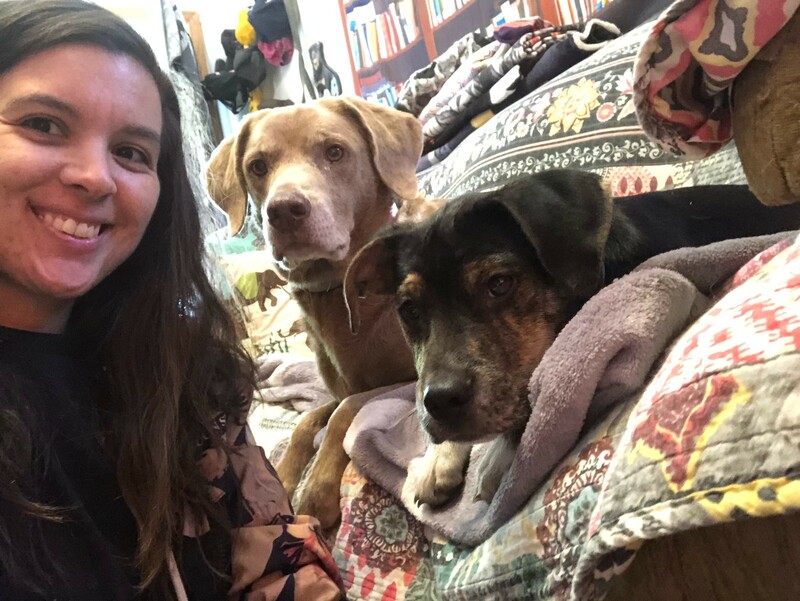 Kerri Caldwell, who lives in Virginia Beach, is lucky enough to have two dogs currently being trained to detect celiac disease. Elliot and Maggie, the former three months old and the latter 11 years old, both receive training from Kerri and trainers at Compass Key Service Dog Training. Kerri was diagnosed with celiac disease in 2015 after having severe symptoms for two years. Her condition was so bad that Kerri was unable to work, as she is extremely sensitive to gluten and had violent skin and intestinal reactions. 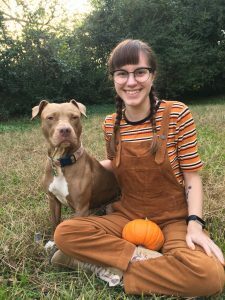 After Kerri was diagnosed with celiac, she learned about gluten-sniffing dogs and, after a year of research, brought her lab, Maggie, to Compass Key Service Dog Training to learn the scent detection techniques. Trainers at Compass Key come to Kerri’s house twice a week for lessons and she works with Maggie at home every day. After one year of training, “I trust her completely,” Kerri said. Kerri with her service dogs in training, Maggie and Elliot. When Maggie detects gluten in a product she is sniffing, she is trained to take a few steps back. If she doesn’t smell gluten in the item, she will sit down, signaling to Kerri that the food is okay to eat. “When we’re at home, she always wants to check my food no matter what, even when I know it’s fine,” Kerri said. Recently, Kerri rescued a new dog named Elliot. Elliot started training right away and Kerri said she expects the puppy to learn quickly, especially since Kerri knows what to expect and teach him after her year of experience training Maggie. She is training Elliot to spin in a circle when he detects gluten in a food item. For Kerri, who was constantly thinking about gluten and whether cross-contamination or even gluten on a surface, like a public telephone, would make her ill, Maggie and Elliot have given her peace of mind and increased quality of life. Nicole Sams’ service dog Pippi has helped her detect gluten for more than a year. 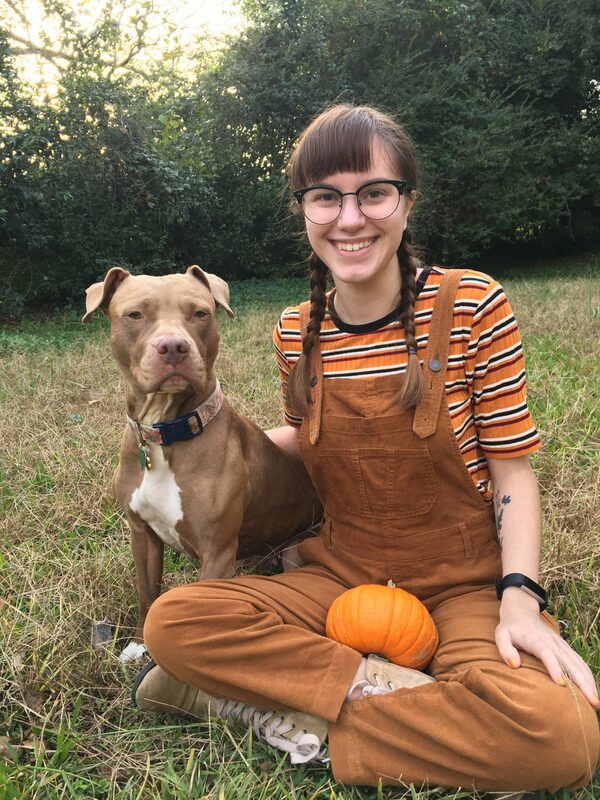 Nicole rescued three-year-old Pippi, a pit bull mix, after she was diagnosed with celiac disease. She trained Pippi to detect gluten herself by purchasing pure wheat gluten and teaching her dog to recognize it. Later in their training, Pippi was able to smell packaged products in a grocery store and determine whether they contained gluten. When she detects gluten, Pippi gives Nicole her paw, and when she doesn’t, she sits. “She’s about 90 percent accurate,” Nicole said. Nicole added that Pippi has helped her at restaurants when menu items claimed to be gluten free but were really cross-contaminated. Since Pippi is a certified service dog, Nicole is able to take her everywhere she goes. She shares photos and videos of Pippi on Instagram @thestudydog. Training a service dog can be expensive, depending on the program and trainers used. It can cost between $10,000 and $20,000, and training must be maintained throughout a dog’s life. However, a Healthcare Reimbursement Account or other Healthcare Spending Account can usually be used to cover the cost of a service animal, including an allergen detecting dog. The cost of buying, training and maintaining a service dog is also tax deductible. According to ADSS, the Veterans Administration may be able to reimburse veterinary cost for the service dogs of veterans and many veterinary offices will discount the cost of their services for service dogs. Is a celiac service dog for you? So at the end of the day, is a gluten-sniffing dog a good option for you? If you travel often, have severe celiac symptoms and have the time and money to invest in training, an allergen detection dog can be a great asset and friend. If you want to train the dog you already have, like Kerri did with Maggie, Kerri recommends starting with a foundation of obedience training and scent work.